Westacre is a global security solutions company, offering a superlative service with the utmost discretion and professionalism. Westacre provides bespoke security services and elite personnel to a wide range of private and commercial clients. We have built a reputation as the Riviera's leading boutique private security company. In our ninth year of operating from the Côte d'Azur and the Principauté de Monaco, we are the 'go-to' provider for high net worth families, their property and business interests. 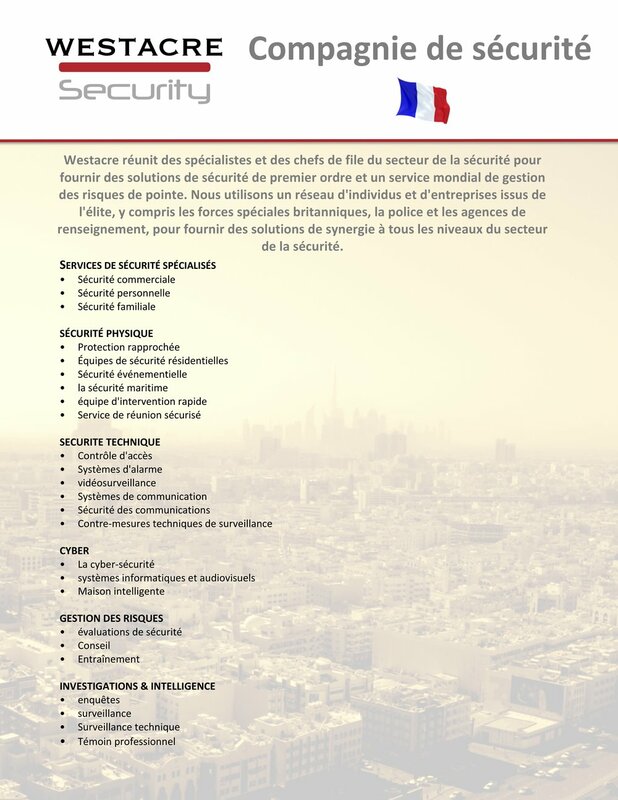 Find out more about our Sécurité here. With specialist departments to implement our core security capabilities, Westacre are able to provide both single capabilities or bespoke full security solutions packages. By using our own in-house departments, we are able to ensure an exceptional level of service, project managed by experienced Team Leaders with maximum discretion and professionalism. Thank you for subscribing to the the Westacre Security Briefing.